Indeed, the manifestation of illegal mining activities in Africa has negative impacts on the continent, with residents who live in mining communities being the most affected. Mining communities adjacent to mines have lost vast tracts of arable lands, and most farmers have abandoned farming in favor of the illegal activity. Illegal mining activity has also contributed to deafforestation and has destroyed rivers and water bodies. The cumulative effect has been the loss of arable land for crop production and food insecurity. Even though data showing trends of food production and associated costs to consumers living in mining communities in Africa are not readily available, visits to mining communities show that most of their food items—which were hitherto produced locally—are now imported from major cities. There are fears that food security will be seriously challenged, and rivers, water bodies, and forests in Africa will be lost if illegal mining activities are not halted. The effects of illegal (Galamsey) mining in Ghana has been devastating over the last few years. Even though small-scale mining was legalized in 1989 during the Military Regime of the People’s National Defense Council (PNDC), it was intended primarily for the local people. However, an increased number of people have become involved in this illegal activity, including a large percentage of Chinese. Previously, illegal miners used traditional tools such as pickaxes and shovels, currently the Chinese are applying new technology and equipment in illegal mining. Even though there have been increased numbers of people entering the illegal mining business and applying new equipment and technology in their illegal activities, there has been little impact on the living conditions of citizens in these communities. Rather, communities in mining areas have experienced negative standards of living and negative effects of mining, including loss of jobs and farmlands, and water pollution. Ghana, Zambia, South Africa, and a host of other Africa countries continue to lose their arable lands, farms, and water bodies through water pollution and bad mining practices. There are constant communal conflicts in mining communities between the mining operators, and the local people who feel they are not protected by state institutions. Visits to mining communities reveal the destructive nature of unregulated mining practices on land and water bodies. In Ghana, the hitherto big rivers like Tano, Pra, Ankobra, Oti, Ofin, among others, have all turned into clayey undrinkable waters, and are gradually drying out. The numerous anti-illegal mining policies have not yielded the desired results, and mining operators fiercely flout these policies. There have been joint security task forces aimed at flashing out illegal mining operators. 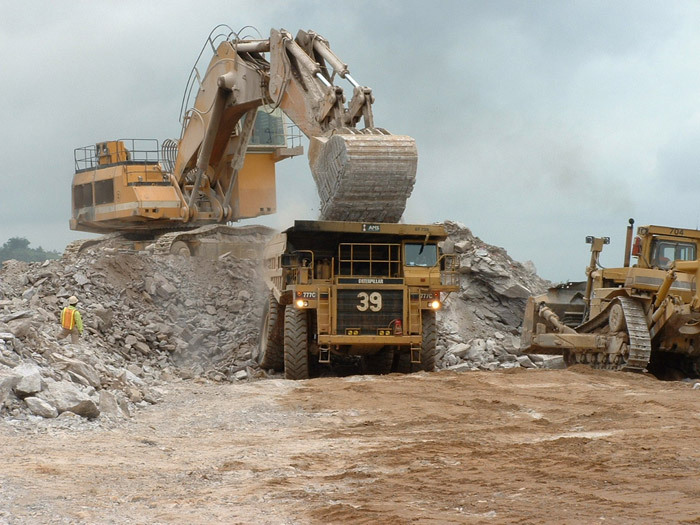 Currently, the Government of Ghana has ordered that all illegal mining and small-scale mining operations cease, yet, operators have found other ways to mine, specifically operating at night. To combat this the government has formed a joint police-military task force, but it faces stiff opposition with threats of demonstrations. Indeed, without stiff punitive measures against illegalities in the extractive industry, the sector will continue to be a curse for African countries. Africa could consider reviewing and revamping its mining policies. African governments and policymakers could also consider equipping their regulatory institutions and law enforcement agencies with the requisite materials, including financial support, human capital, and modern equipment to be able to track, apprehend, and take actions against companies who breach mining regulations. The United Nations Economic Commission for Africa (UNECA) may consider reviewing and strengthening its policies and recommendations on regulating mining activities in Africa. Especially on the various laws and programs that focus on sustainable consumption and production, such as the Agenda 21 (PFIA21), and the Johannesburg Plan of Implementation (JPOL), which touch on effective and transparent regulatory frameworks, transparency and accountability, and artisanal and small-scale mining among others. The Africa Union (AU) could consider monitoring member nations in their implementation of the Framework and Guidelines on Land Policy. Specifically, the AU could possibly commit to its resolution to ensure that member nations formulate and operationalize sound land policies to sustain human development that assures social stability, maintains economic growth, and alleviates poverty. The international community, including policymakers, could intensify their pressure on African countries to observe best practices in its regulation of mining industries. The measures could include engaging independent civil society organizations and the extractive industry to monitor and report mining operations, and blacklist minerals from countries that do not conform to international practices on mining. Foreigners, mostly Chinese goldminers have taken over illegal mining in Africa, and have introduced new technologies and equipment into illegal mining activities. With modern equipment, their activities can destroy large tracts of land and forest reserves within one day, and can destroy water bodies within a few hours. The “Galamsey” activities have turned drinking water into clayey water and destroyed arable lands and forest reserves. It is therefore not surprising that most African farmers have defected from their farming and joined the “Galamsey” business. There is food insecurity in the mining communities, to the extent that food is being imported from other cities. Food insecurity and the loss of bodies of water will continue if proper extractive regulations are not formulated and if existing regulations are not enforced. Paul Nana Kwabena Aborampah Mensah is a Senior Programs Officer for the Ghana Center for Democratic Development (CDD-Ghana). He is also a former Southern Voices Network for Peacebuilding Scholar. Paul Nana Kwabena Aborampah Mensah is a Senior Programs and Research Officer with the Ghana Center for Democratic Development, and has conducted research on illegal mining activities in Ghana. Galamsey is a term used to describe the uncontrolled and illegal mining activities in Ghana. The indigenous people in mining communities engage in Galamsey, using traditional tools such as shovels, pick axes, and head panes for mining operations. However, the influx of foreigners, especially the Chinese into the illegal mining activities has led to the introduction of modern technologies and equipment into illegal mining. “Impacts on Mining,” Oxfam Australia, https://www.oxfam.org.au/what-we-do/mining/impacts-of-mining/. Abraham Frank Eshun, “Stamp out galamsey due to its negative effects,” Ghanaweb, May 9, 2017, https://www.ghanaweb.com/GhanaHomePage/features/Stamp-out-galamsey-due-to-its-negative-effects-536233. Ignitious Tetteh Ocansey, “Mining Impacts on Agricultural Lands and Food Security – Case Study of towns in and around Kyebi in the Eastern Region of Ghana” (bachelor’s Thesis, Turku University Of Applied Sciences, 2013), https://www.theseus.fi/bitstream/handle/10024/53720/Ocansey_Ignitious.pdf?sequence. Kobby Anyimiah William Ackah, “A study of Chinese Infiltration into Small Scale Mining in Ghana and its Implications on National Security” (master’s thesis, University of Ghana, March 2014), http://ugspace.ug.edu.gh/bitstream/handle/123456789/21288/A%20Study%20of%20Chinese%20Infiltration%20into%20Small%20Scale%20Mining%20in%20Ghana%20and%20its%20Implications%20on%20National%20Security_March%202014.pdf?sequence=1&isAllowed=y. Abraham Fran Eshun, “Galamsey: An Enemy of Ghana’s Arable Lands and Water Bodies,” Modern Ghana, April 3, 2017, https://www.modernghana.com/news/766142/galamsey-an-enemy-of-ghanas-arable-lands-and-water-bodies.html. Mr. Paul Nana Kwabena Aborampah Mensah is a Senior Programs and Research Officer with the Ghana Center for Democratic Development, and has conducted research on illegal mining activities in Ghana. His field work includes community work in mining communities, visiting and assessing the topical issues that border on governance, development and security. Mr. Mensah has visited six big rivers in Ghana since the beginning of Galamsey, focusing on its destructive nature on rivers. Specifically he has visited I have visited the Offin, Pra, Tano, Oti, Ankobra, the White and the Black Voltas rivers of Ghana. The Parliament of the Republic of Ghana, Minerals and Mining Act 2006, (Accra, Ghana, 2006) https://resourcegovernance.org/sites/default/files/Minerals%20and%20Mining%20Act%20703%20Ghana.pdf. “Operation Vanguard” was launched in Ghana in August 2017 in order to wipe out Galamsey operations in Ghana. It is a combined team of military and police personnel who enforce the government’s policy of halting all small-scale mining activities in mining communities. United Nations Economic and Social Council Economic Commission for Africa, Africa Review Report on Mining, CFSSD-6, (Addis Ababa, Ethiopia, 2009), https://sustainabledevelopment.un.org/content/documents/AficanReviewReport-on-MiningSummary.pdf. African Union, African Development Bank, and Economic Commission for Africa Consortium, Land Policy in Africa: A Framework to Strengthen Land Rights, Enhance Productivity and Secure Livelihoods, (Addis Ababa, Ethiopia, 2010), https://www.uneca.org/sites/default/files/PublicationFiles/fg_on_land_policy_eng.pdf.